What are the options for importing my customers into Housecall Pro? There are two options for importing your customer list into HouseCall. The first and most common option is through your QuickBooks Online account. 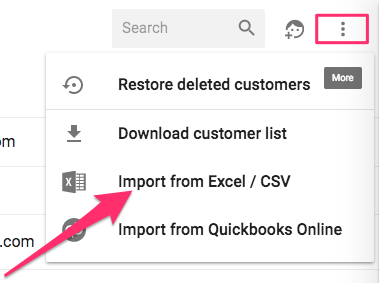 You can easily import your customer list, price list and past jobs from Quickbooks to Housecall Pro. The second option is to import your customer list directly into Housecall. You can chose to do it yourself OR email your customer list in excel format to datahelp@housecallpro.com to have it uploaded for you. If you chose to have our team at import your customer list for you, please allow 3 to 5 business days for it to appear in your database. Click 'Customers' at the top left of your admin dashboard. A window will appear where you can download the customer list template. Download the customer list template. You MUST use this format to upload your customer list. The template we provided can be opened in Excel, Numbers, Open Office, Google Sheets or any other spreadsheet editing software. There's some sample data included so you can see how the format of each column should look. You can delete this before you import your file. Add your customer list to the template in the correct format. You can add up to 10 addresses per customer in your saved list. 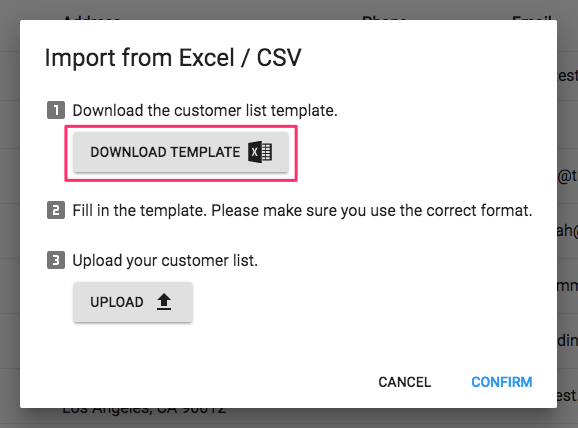 You can also include customer notes and include tags (referred to as Source in the spreadsheet). IMPORTANT: If the CSV file you try to upload doesn't have the same column names and format, it won't upload to your list. After you have entered your customers & information into the template, save it to your computer. Navigate back to the upload screen and choose the list you want to upload. Click 'confirm' when you’re ready. Depending on the size of your database, it could take up to an hour to fully import everything. Most uploads should be completed within a few minutes. For things like names and addresses, you’ll want to split up your information to match the column headers. This means separating First and Last Names and addresses. Here is some info on splitting text into columns if you need some assistance. The upload only accepts 1 email per contact. You can either put additional emails in the Customer_Notes column or create an additional customer. For phone numbers, you only need the 10 digits phone number. This means no “1” in front of the number, spaces, “( )” or “-”. Find and replace is a good way to accomplish this task.